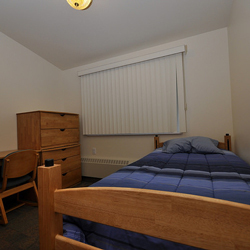 PWSC offers economical guest lodging in the on-campus apartments each summer from late May through early August. We offer studios to three-bedroom apartments. All rooms have single-person beds and private bathrooms. PWSC Guest and Conference Housing offers economical guest lodging in the on-campus apartments each summer from late May through early August. Designed for student housing with privacy and security in mind, rooms are available as studio, one-bedroom, two-bedroom, or three-bedroom apartments. All rooms have single-person beds and private bathrooms. While the majority of summer guests do attend conferences, classes, or events held on campus, lodging is available for individuals and groups not affiliated with the College. Available dates change from year to year based on campus activity. For confirmation of May through August availability, please contact the Housing Manager at 907-834-1634 or housing@pwsc.alaska.edu.